Aboriginal and Torres Strait Islander people — please be aware this website may contain names, images and voices of deceased persons. The Office for Women hosts the State Aboriginal Women's Gatherings which are an initiative that provide an opportunity for Aboriginal and Torres Strait Islander women to come together to talk about issues which affect their lives in a culturally supportive environment. One-day Gatherings are held in various locations within the State with local participants attending. Each year the Gatherings focus on a particular theme and related topics relevant to the area, and engage guest speakers from service delivery organisations to provide information to participants. Attendees also participate in facilitated workshop sessions, discussions and networking. Having Gatherings in specific locations enables Aboriginal women who live in those locations to attend and to ensure a local community focus. 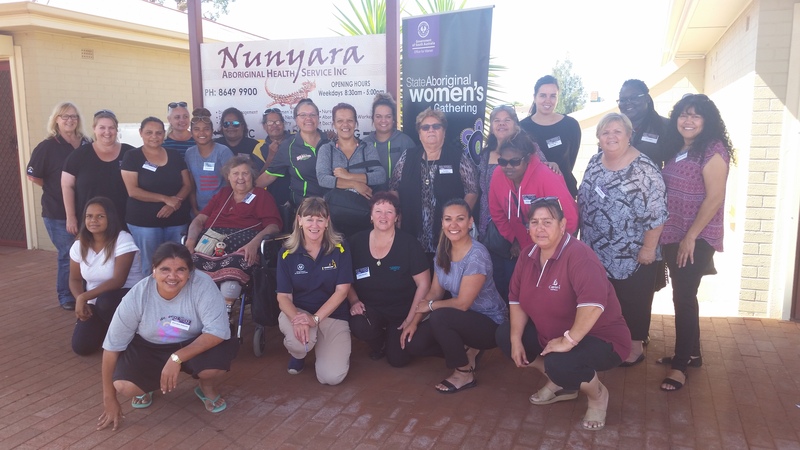 The Office for Women acknowledges the importance of ongoing engagement with Aboriginal women in this state and believes that Gatherings in regional and remote areas will allow more Aboriginal women to engage with the Office. The opportunity to travel and meet with women in their own communities enables the Office for Women to hear from those living in communities about their issues and experiences; to exchange information; and develop further communication links between metropolitan and regional based women within South Australia. The next SAWG dates are currently in the planning stage for the first half of 2019 and will be held in the South East Region of South Australia on Boandik country. Watch this space for future updates soon. Far West Coast Gatherings were held in Yalata and Ceduna on 18 and 19 June 2018. This picture shows the group at Yalata. The Gladys Elphick Awards are the first South Australian Aboriginal Awards to be created for and by Aboriginal women and there are lots of women within our communities who are making a difference.